Culture Secretary Tessa Jowell is visiting India to encourage the Bollywood film industry to make more movies in the UK. She hopes to encourage film partnerships between the two countries at a conference in Bombay (Mumbai). It comes at a time when the UK government faces criticism for closing a tax loophole that had previously enticed foreign productions to the UK. 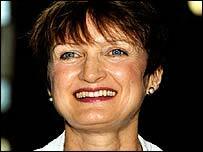 Ms Jowell will also highlight the need for a global effort to fight piracy. Speaking to 2,000 business delegates at the Frames entertainment festival, she will call for the industry to make film fans aware of how it affects the market. Her speech will also cover the opportunities and threats facing the global industry. A total of 10 Indian films were shot in the UK in 2001, spending £2.5m. But India produces more than 1,000 films a year - leaving scope for more to be brought to UK shores. There are fears for the strength of the UK industry after a tax loophole that film investors had been taking advantage of was suddenly closed, leaving many productions in jeopardy. The government has promised the Budget will reveal details of new tax relief to help low-budget films - but that is expected to replace a different tax break being scrapped next year.